Galway East Tourism - Slatefort House Restaurant in East Galway, West of Ireland.Galway East Tourism - Slatefort House Restaurant in East Galway, West of Ireland. Situated approx. 2 miles from Loughrea on the Bullaun/New Inn and surrounded by 6 acres of gardens. It is a unique setting for that special occassion or a casual meeting with friends. 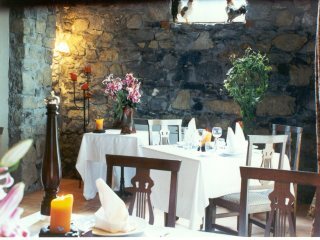 Slatefort House Restaurant is Recommended in the Bridgestone Guide to the 100 Best Restaurants in Ireland for the past four years, and offers a vast menu and extensive wine list.